Concrete cutting relies on the best possible tools and experienced workers who can complete the work quickly and safely. Concrete cutting relies on the best possible tools and experienced workers who can complete the work quickly and safely. However, to ensure that the job goes smoothly, you’ll want to make sure that your employees feel as safe as possible. 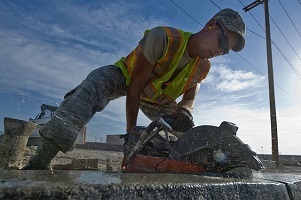 One of the most significant risks of the concrete cutting process is injuries due to vibration from the tools they use. Hand-arm Vibration Syndrome: This condition is where various parts of the arm and hand are damaged by the vibrating of the tools used: Muscles, joints, blood vessels, and nerves can all be affected. Carpal Tunnel Syndrome: Carpal tunnel doesn’t only affect office workers who sit at desks all day. This condition also affects concrete workers who will feel numbness or tingling in their hands, palms, fingers, and wrists. Vibration White Finger: This condition refers to the problems caused by circulation being cut off. Two alarming signs are when the hands go pale and numb. Ensure that everyone who operates concrete cutting tools has all the necessary training to do so. If your team is working on a residential project, then homeowners or property owners could insist on using the tools themselves. Don’t let this happen. All workers who are responsible for using concrete cutting tools need to be careful as well. There are set limits regarding how long they can use vibrating tools during a typical workday and workweek. Ensure that your workers are following the procedures put in place for their protection. Reducing the risk of vibration injuries depends on common sense. Your workers should start their work by using the lowest power settings possible and switch to higher settings only if necessary. All of your workers should also rotate their tasks so that they can switch off when they get tired or start feeling uncomfortable. Reducing the risk of vibration injuries also means that every piece of equipment needs to be kept in good condition. While newer tools deliver less kickback to their operators, each worker who handles them should wear gloves and sleeves to protect their arms, wrists, and hands. This entry was posted on Thursday, September 20th, 2018	at 4:29 pm	. Both comments and pings are currently closed.